Hello Slief, i have recently purchased an DC 200 with the MRD pump for my 150 gal tank. Can you please explain me how to fine tuning with the pump nozzle since i run the skimmer in 8,5 in of water and my SPS dominated tank has a medium organic load. I understood that by unscrew the nozzle i allow more water but less air , am i right?. You open the nozzle until you get the foam nice and thick. I would start at 1.5 turns out and open it further from there until you get the foam where you like it. The more you open the nozzle, the more air goes into the skimmer. 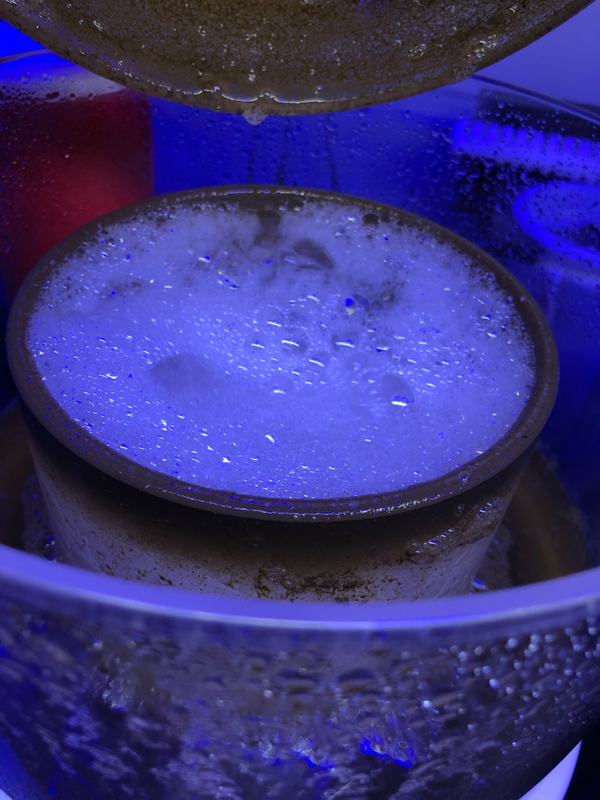 You are aiming for nice thick foam but since every system is different, the ideal settings will vary from one tank to the next based on the amount of dissolved organics in the water and other factors. Once you get the foam where you like it, use the wedge pipe to adjust the water level inside the skimmer between wet and dry skimming. I’d aim to get the line where bubbles turn to foam up to the bottom of the neck for a dry skim. After5 days I can’t see the line where water became foam is it normal ? You may not be looking carefully enough it could be hidden by the part where the cup attaches to the neck or you may have the level set to low inside the skimmer. Do you have good foam foam? How many turns out on the nozzle do you have it set to? How about taking a video and posting a link to it or taking some decent pictures so I can see what it looks like inside the skimmer and in the neck. Looks OK. Maybe a bit wet. Try opening the wedge pipe up a bit and or opening the nozzle a bit more. 1/2 turn out from fully closed isn’t much IMO. I think you would want more out on the nozzle. You may need to lower the level inside the sump or raise the skimmer up a bit so you can tune it better. 8” of water might be a better starting point for you. 9.2” is too much. You have no range of tuning at that level. Lower the level in the sump or raise your skimmer. 8.5” is the max I would suggest with that skimmer/pump combo and in some cases, 8” might be better. How i can upload a Video? Now water level around 8", 1 turn counterclockwise but still no separation line, now the MRD is one week old. Go to youtube and upload it there and then add the link to a post here. You may not see a good separation line but I also think you need to open the nozzle more than 1 turn out from fully closed. In the end, it's all about the foam in the neck. If this is a new system without many fish, the skimmer won't have sufficient dissolved organics to create great foam and that will have a big impact on what you see in the body and neck. How many fish are in this system? Again, you NEED to open the nozzle up more. That allows more air into the skimmer which will improve the skimmer performance. You should start at 1.5 turns out and open it more until you find a spot you like. You might need to go 2 turns out, 3 turns out or even 4 turns out. It's all about making small adjustments once you get the nozzle close. That nozzle is for fine tuning so put some gloves on and make some adjustments to the nozzle until you get the performance you want. The gloves will help you avoid killing the foam head from oils in your skin impacting the surface tension of the water. It looks fine. Just looks like you need to do some fine-tuning with the nozzle as I suggested above in my previous response. Don’t leave it unconnected under water as that will contribute to salt buildup in the venturi port and reduce air intake. Either cap it off at the pump or connect the ozone tube and let it draw air. Open the wedge pipe and that will make it less wet. Stop worrying about the separation. Pay more attention to the foam. Nozzle adjusts the foam density and the wedge adjusts from wet to dry. Add the ozone tube and that will add more air to the skimmer too which may have a dramatic effect on your foam. My sump level at moment is 21 cm do you think I have to low to 20 cm? Also keep in mind that you changed pump which changes the characteristics of the skimmer. With the RD3, the air intake is tied directly to the motor RPM which changes as you adjust the wattage. With the RD1 pump, the RPM is fixed and the air intake is controlled by the nozzle adjustments so the skimmer is going to respond different than with the RD3 which is controlled by the pump speed/wattage to adjust foam density coupled with the wedge pipe to adjust from wet to dry. The key to fine tuning with the RD1 is finding the sweet spot with the nozzle adjustment to get the most dense foam coupled with monitoring the skimmate to find a point in the nozzle adjustment and wedge pipe setting that makes you happy in terms of color, smell of the skimmate production. I think you are over thinking things and your sump level is fine. See my responses above.